The chairwoman of the Tennessee Democratic Party said the party was open to supporting far-left socialist candidates if their values line up, telling an NPR affiliate "we've got a big tent." Nashville Public Radio reported on the founding of a new chapter of Democratic Socialists of America in middle Tennessee; they claim to have 300 members. While Nashville is a Democratic city—Davidson County has voted for the Democratic presidential candidate in seven straight elections—Tennessee remains a red state, and President Donald Trump won it by 26 points in 2016. The local DSA group doesn't plan on running candidates in the 2018 cycle but could in the future, and state party chair Mary Mancini said they would be "open" to working alongside them. "We've got a big tent, and we are open to working with people that share our values," Mancini said. "We may not agree on everything 100 percent, but that's okay." One of the new members, Chelsea Grundy, told Nashville Public Radio the 2016 election "radicalized" her, leading her to join the democratic socialist group. "Definitely after the last election, that I kind of got radicalized," she said. "[I] decided to take my anger and upset over what happened and try to do something with it." 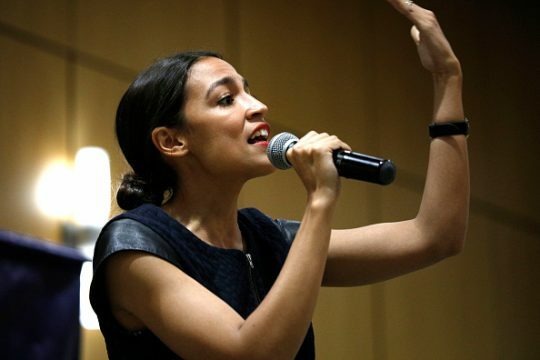 The ascension of politicians like New York congressional candidate Alexandria Ocasio-Cortez and Sen. Bernie Sanders (I., Vt.), who both identify as democratic socialists, has heightened ideological differences within the Democratic Party as it seeks to win back states in the South and Midwest. The Middle Tennessee chapter battles what it calls perceptions of American socialism being similar to socialism in Venezuela, where the leftist, authoritarian government is beset by corruption and has overseen a total collapse of the economy. A new poll shows Democrats are more likely to view socialism (57 percent) positively than capitalism (47 percent). This entry was posted in Politics and tagged Alexandria Ocasio-Cortez, Bernie Sanders, Democratic Party. Bookmark the permalink.